Prices are per person, plus tax and do not include gratuities. 3 Hour Private Ride $75 per person +$100 one time surcharge. 1 hour ” kids” trail ride $50 (weekends only as horses are available. 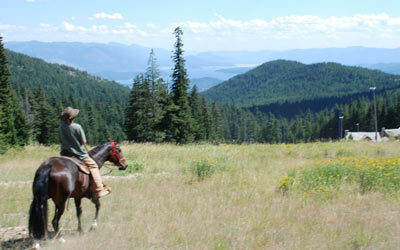 Two and a half hour trail rides are scheduled at 9 am and 1 pm daily. One hour ride leaves at 2pm Weekends, and weekdays as horses are available. Average size of group is 6 guest plus a guide. Private rides are approximately 3 hours long, leaving morning or afternoon . No group minimum; your group plus one guide. We recommend prior riding expierence. Please reserve your ride at least a day in advance, we will do our best to accomodate walk-ins. To reserve, call 208-263-8768 (TROT) . *Rates are subject to change, we will try to keep rates as current as possible.